Heavy Duty Structural Aluminum Gangway with deck planking. Customized lengths and widths to suit your application. Typical Maximum Inclination of 30°. Davit with Steel Stowage Equipment. Schoellhorn-Albrecht designs and manufactures beam style gangways in a wide variety of sizes and styles. Built with a heavier material and smoother surface our beam style gangways are ideal for permanent bridges or walkways. Customization options are available to accommodate your facility. 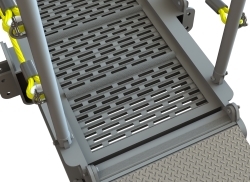 Our gangways are used by refineries, military ships, and industrial ships, operating effectively throughout the world. Product details and specifications are subject to change without notice. For additional information, drawings and specifications contact us.